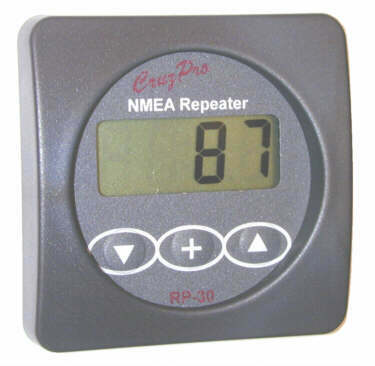 The RP60 remote data repeater is capable of displaying over 200 standard and proprietary NMEA 0183 sentences. The RP60 can monitor up to 4 separate data channels and can be trained to learn new sentences. New sentence formats can be downloaded into re-programmable, non-volatile flash memory using the RS-232 serial data port of a PC compatible running Windows Win98, WinXP, Win2K, Vista and Win7. Up to ten new sentences can be stored in the on-board flash memory - these can be re-programmed as many as 1 million times so your RP60 will never go obsolete. Compact design - only 2-1/2" diameter and mounts in a standard 2-1/8" round instrument hole. Five levels of backlighting can be selected and all set-up information is automatically saved to non-volatile memory. The RP60 works on both 12 and 24 VDC systems. Since CruzPro instruments, such as the T60 temperature gauge, OP60 oil pressure gauge, RH60 and RH110 RPM gauge, etc. all output NMEA 0183 data, you can connect up to four of these instruments to one RP60 remote data repeater and see the same data at a remote steering station without having to replicate the entire set of instruments. 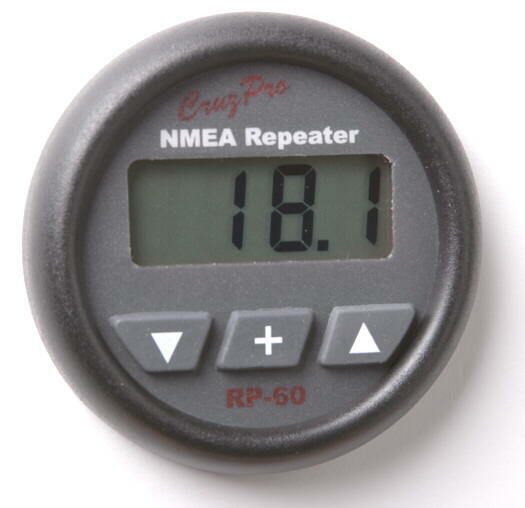 In fact, you are not limited to seeing data only from CruzPro instruments - the RP60 will repeat data from anyone's NMEA 0183 instrument. You could connect a NMEA 0183 signal from a RayMarine or Garmin instrument to the RP60 and it will repeat that information as well. 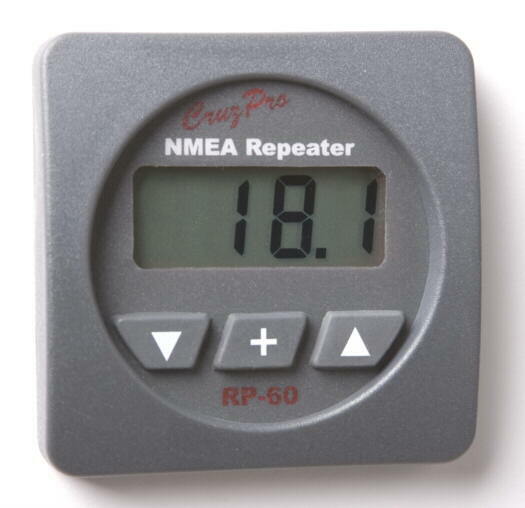 The RP60 is already factory pre-programmed to repeat 200 "standard" pre-defined NMEA 0183 sentences. There is a "flash" memory (re-programmable) that allows the user to add up to 10 more new sentences. You simply connect the RP60 to a computer's RS-232 output port and use the PC computer program that is provided with the RP60 and "teach" the RP60 new sentences when required. 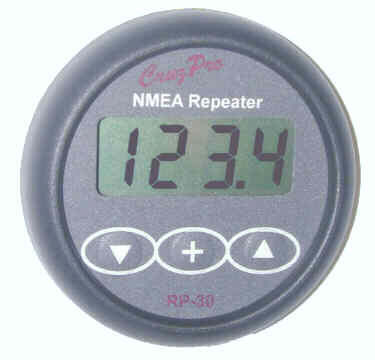 This allows the RP60 to recognize and repeat future NMEA 0183 sentences that have not yet been defined today. Therefore the RP60 will not go obsolete.